I got this article in a set of newspaper and magazine clippings. 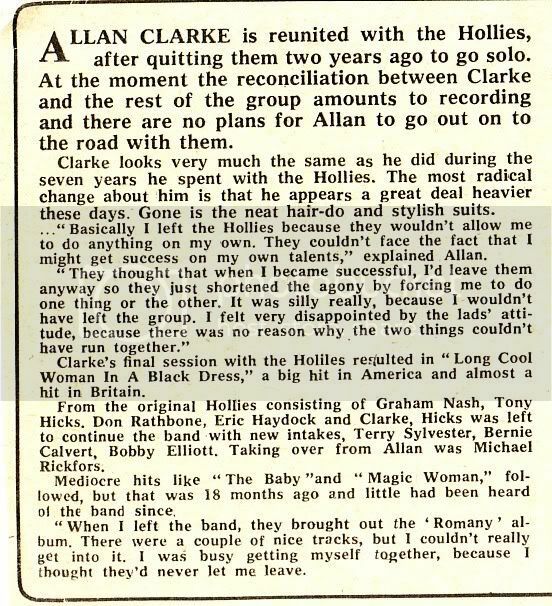 I don't know the date or the name of the publication, but it was probably from 1973 or 1974, because it discusses Allan rejoining the group after an 18-month absence. He looks good as ever in the photo. I'll forgive him the haistyle, because Allan's gorgeous no matter what! "Friendship has yet to come", ah,that sounds sad .I trust it did in time.Feelings appear to be quite raw in the interview.I sometimes think the Hollies' relationship was like a marriage,sometimes very close,moving in the same direction.Other times not being able to be in the same room together,pulling in oppposite directions.Trial separations and big reunions.But unlike most marriages the "sweet music" they made was shared by the world . Mean't to thank you,pet for the post.Cheers Vrinda . He conveniently failed to mention that HE needed them, since his two solo albums bombed badly. That thought had crossed my mind too. "The musicicans in the band aren't outstanding but their sound is..."
Well their sound is outstanding but as musicians they are also outstanding... why on earth did he say something stupid like that? Tony Hicks and Bobby Elliott are absolutely outsanding musicians... at least they were in their prime. I just listened to the new Romany CD and the drumming couldn't be any better - absolutely perfect - powerful when needed and tasteful when needed. I wish I could play that good, tight and precise. And Tony's and especially Terry's harmonies are in my opinion enough to make them sound like the Hollies vocally. The truth of the matter is they needed each other.It was a mutually beneficial relationship .When he was talking about no one in the band being outstanding what I think he mean't was that no one person was the Hollies and I think he was including himself here too.Remember when you read something you are not getting the tone of voice being used and you might not be getting the spin the journalist is putting on it.I know Allan has an ego but so have the others and at times I'm sure they could all be equally pig-headed and alittle misguided.The result was Allan returned and that made a lot of people happy. . The reunion album (Hollies) was great, but that can't be said about the subsequent albums. Each had its moments, but the joyful spirit from 1974 did not last. "Another Night" was mostly a somber affair. "Write On" was only a slight improvement. "Russian Roulette" had at least one classic on it, "Draggin' My Heels" and "Daddy Don't Mind" is good, too, despite that odd trombone break. "A Crazy Steal" and "5317704" were too ballad-heavy. So it is arguable whether it was really a good thing or not that Clarke returned. I think the overall perception was that they couldn't keep up with the new bands making hit records during the latter part of the '70s. Plus Clarke's appearance wasn't youthful, with that lousy perm and the forced suntan. These things DO matter when it comes to popularity. Now if they had stuck with Mikael Rickfors, it would have been a different story altogether. The band was going in the right direction musically with him. It would have been interesting had they continued with Rickfors, to say the least. Hey, Dennis, was there something else you meant to say in that last post but forgot to type it in? You've got Paula's and your previous post boxed, but no current one. No, that was a goof-up on my part. I didn't know how to correct it, so there it is. Oops! I couldn't agree more with your post. Right on target. Yes, Dennis, I agree with you to a certain point. I like the Rickfors-era albums more than "Russian Roulette" and "A Crazy Steal", as well. But we may not forget that a band needs hits more than a youthful appearance, and The Hollies did not have a worldwide smash-hit with Rickfors comparable to "The Air That I Breathe". Even "Sandy", "Write On" and "Boulder To Birmingham" get more radio airplay than "The Baby" or "Magic Woman Touch". And it shows that they had success with ballads in the mid-1970s. So, how can anybody say that the direction they were going was wrong ? And "It's In Everyone Of Us" from 1979's "5317704" is one of the most beautiful Hollies songs I know. I'm not sure whether they would have had the same success with Rickfors. The Hollies could not repeat the success they had in the 1960s but they had their chart moments in the 1970s and it would not have been better with Mikael Rickfors. But don't get me wrong. I love the Rickfors-albums, "The Baby" is one of my favourite Hollies songs and "Out On The Road" is my favourite Hollies album. 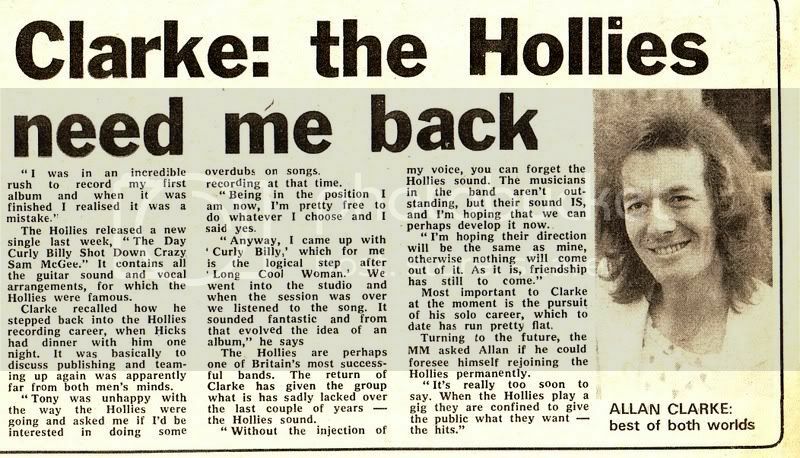 I just wanted to make clear that I also think that The Hollies needed Clarke to reach those higher chart positions they have reached with "The Air That I Breathe". And I like their later albums, as well. My favourite post-Rickfors album IS the ballad album "5317704". Could anybody else sing "When I'm Yours" or "It's In Everyone Of Us" as emotional as Allan did ? And let's not forget about the great emotional guitar solo by Tony in "When I'm Yours". Songs like these show how professional The Hollies were when they made music. Rickfors or Clarke ? Thanks to both of them for giving great songs their voice (and, of course, writing them, in some cases). And, of course, thanks to The Hollies for their whole song and album catalogue. This is, of course, all speculation on our parts. But one lone hit, "The Air That I Breathe", was really all that came of the reunion with Clarke, quite a disappointment on reflection. As for the chart success of the Rickfors period, "Magic Woman Touch", even though it was foolishly ignored in the UK, did make the Top 10 in Holland and Australia, and the Top 60 in the US. "The Baby", as you rightly state, is one of the best recordings in the Hollies catalogue; it is simply a magnificent track. I still believe "If It Wasn't For The Reason" would have made some headway chartwise (at least here in the US where country-rock was all the rage at the time) had it been released. And the hip and humorous "Mexico Gold" also would have been great as a US single, instead of the "Long Cool Woman"-ish "Curly Billy". I think the two Rickfors LPs are flawless. But then, so is the '74 LP with Clarke. It was just an excellent time period for the band, regardless of lineup.